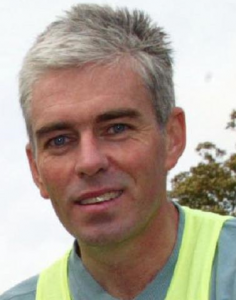 Peter McColgan, like John Joe Barry, Cyril O’Boyle, and others, is an Irishman who is a quality athlete and who has lived and run in Scotland, adding to the challenge for domestic athletes. He came here initially in 1986 but his real contribution came between the years 1987 – 1992. His career in Scotland will be checked via his performances in championship and other major races like the Edinburgh to Glasgow relay, while acknowledging that there were many very good races in Ireland, such as his two steeplechase championships in 1985 and 1989, and on the continent during the period in question..
Peter McColgan was born in Strabane, County Tyrone in Northern Ireland on 20th February, 1963. Like several other very good Irish runners he has lived in Scotland for some time now and contributed considerably to Scottish athletics. Unlike the others though, he has won Scottish and British championships as well as Irish ones while representing Ireland over the country and on the track. He first came to my notice in the mid 1980’s when two athletes that I was coaching went at Liz Lynch’s instigation to Alabama University. While they were there they were part of a small close knit group of Irish and Scots runners which included Liz and Peter. Peter was a very good athlete at college and it is from this time that I reprint the following article from the local newspaper. Before the conference meet however, McColgan still has a few more meets to go. This week he’ll be part of a Crimson Tide contingent travelling to Des Moines, Iowa, for the Drake Relays. “Pete has really made a great improvement over the year,” said Mitchell, “first in cross-country, then indoors and now outdoors. He’s been able to improve for two reasons. He’s really worked hard and paid his dues and I think mentally he’s thinking a lot faster and better than he was before.” McColgan, who at 5′ 7″ and 130 lbs is the smallest man listed ion the Tide roster, also has noticed an improvement in his performance. He chalks it up to an improvement in training methods. “Before I came here, I never really trained that much,” said McColgan. “I would train hard and long for three or four weeks then get lazy for three or four days. Back home it was easy to get out of training because I had to train by myself and motivate myself. You can do that for awhile but after a time you get burned out. Here coach expects me to train and that gives me some motivation. Also I have a lot of other people to train with. That makes it easier, because you can push them, and they can also push you.” Mitchell, a distance runner himself in his college days has seen McColgan’s method of training first hand. “He’s really just made some great strides,” said Mitchell, “He’s got a tremendous mind and head for distance running and he also has a very good work ethic. He’s not afraid to work out. But by the same token, he has the ability to judge just what he needs to get out of a particular workout. He knows when he needs to control the workout, and when he needs to push it.” Mitchell hopes that McColgan can continue to push straight through the SAC and NCAA meets. McColgan, who has a recorded time of 4:02 in the Mile to his credit, has run the Tide’s top times this season in both the 1500 and 5000. He ran a 3:47.08 in the 1500 back on March 16 and followed a week later with a 14:26.61 in the 5000. Peter, who only took up athletics at the age of 17, had always been a good runner and had set his first Northern Irish record four years earlier – he had run 9:11.59 for the 3000m steeplechase on 18th May, 1982 in Belfast as a 19 year old. He would go on to set more records including the 2000m steeplechase and the indoor 3000m. It is however fair to say that his career in the United States really brought him to the notice of the wider world. In Alabama, 1986 was probably his best year – He won the SEC Championship steeplechase and he ran well enough at the NCAA Championships in Indianapolis to be made an All American. He set the College steeplechase record of 8:29.35 and ran 8:32.7 for the SEC record. When you look at the lists of names for the endurance events in these rankings you get some idea of the quality of running he was doing at that time. He was selected for the Irish team at the Commonwealth Games in 1986 and competed in both 3000m steeplechase and 5000m flat, making the final in both. In the steeplechase he was seventh in 8:45.71 and in the 5000m he finished twelfth in 13:58.75. It should be remembered that this came after the US college trio of back-to-back seasons – cross-country, indoor and outdoor track with not a break between them and in which he could be called upon to run any of the events between 800m and 10000m, and possibly on occasion, double up. 1987 was dominated by his marriage to Liz Lynch, newly crowned Commonwealth Games 10000m champion. They had attended Ricks College in Idaho together and gone on to the University of Alabama where they were among the stars of the track & field programme. Peter came to live in Scotland in 1987 although he had been here in 1986 and run for Dundee Hawkhill Harriers. But it was on graduation that he came to Scotland and his best years here were between 1987 and 1991. A good cross-country runner, on the track his best event was usually thought to be the steeplechase. With good reason: in 1982 he had set two Irish Junior records for the event – the 2000m time of 5:50.19 was on 1st August at Cwmbran,, and the 3000m 9:11.59 at the Mary Peters Track in Belfast on 18th May. He was already known to the Scottish running public after he had run into third place in the SAAA Championship steeplechase in 1984: running in the colours of the Northern Irish club Apollo, he ran 9:03.87 in a slow run race. It was to be the only steeplechase medal he won at the Scottish national championships. We can maybe start this profile with a look at the high spots of his 1986 season. His first good mark that summer was in a flat 3000m at Gainesville, Florida, where he clocked 7:54.48. He also set an NCAA record for the steeplechase of 8:32.71. On 18th July he came down a distance with some success. In the Pearl Assurance Games in Birmingham, England, he was ninth in a very fast Mile and recorded 3:59.37 to be below sub-4 for the first time. Then it was Commonwealth Games time at Edinburgh. Here he had been selected to compete in the 3000m steeplechase and the 5000m. He ran in both Finals and in the steeplechase he was seventh in 8:45.51 while in the 5000m he was twelfth in 13:58.75. He followed that up on 5th August, at Gateshead with a 2000m steeplechase in 5:31.09 which was an Irish senior record in the colours of Irish club Sparta. It was a good summer and he went in to the winter season in good condition and the highlight might well have been running in the world cross-country championships in Warsaw on 22nd March where he ran well against the best in the world. In summer 1987 he has two times listed in the www.scotstats.net website – 1:54.7 for 800m and 8:11.0 for 3000m. He couldn’t be ranked as he was not a Scottish national but as an indicator of his fitness level, it was encouraging.. He had his first run in the Edinburgh to Glasgow in November 1987 when he was on the high quality second stage, move the club from eleventh to third with the fastest stage time of the day in the team which unfortunately finished fourth. He had run the second stage of the National relay a matter of weeks earlier and turned in the fifth fastest time to see the team finally cross the line in eighth place. His only other championship run that year was the East District event which he won. There was no run in the national cross-country championship nor in the six-stage road relay. In summer 1988 came his first senior AAA’s steeplechase medal when he finished second. He was ranked in three events in Scotland – the 1500, the 3000m and the 3000m steeplechase. In the 1500 he ran 3:49 which was the tenth fastest run in the country or by a Scot that year, in the 3000m 8:07.8 which would have ranked him ninth, and in the steeplechase 8:37.52 he would have been ranked second – 17 seconds behind Tom Hanlon and 14 ahead of Graeme Croll. He did not do much Scottish championship racing over the winter of 1988/89. He again began with the Edinburgh to Glasgow where he moved to the fourth stage, again he picked up places – from 12th to 11th this time – to see the club seventh after the eight legs. At the very end of the winter he turned out in the Six Stage Road Relay on the fourth stage when he was fourth fastest and picked up a silver medal when the club was second. Summer 1989 was his best yet in the blue and white colours of Dundee Hawkhill Harriers. His best times for the summer were 1:52.8 for 800m, 3:47.2 for 1500m, 7:57.82 for 3000m, 14:01.73 for 5000m and 8:34.10 for 3000m. steeplechaseFaster in every event than the previous summer with the 3000m being outstanding. The 1500m time was done in Antrim on 27th June and the 3000m two weeks earlier on 9th June in Helsinki. In 1989/90 Peter ran in three championship races plus the Edinburgh to Glasgow and he had fastest time of the day in all of them. Starting with a run at home in Dundee in the East District relay, he ran the fourth stage to return the fastest time and bring the club home victorious. On a short course (about 13 minutes running) he was 23 seconds faster than the next man – Keith Logan of Teviotdale. On to the National Relays when he was again fastest over the course (14 seconds faster than Alistair Douglas) on a 12 minute course at Inverness and Hawkhill was second. Peter was again fastest man over the course when he raced the second stage of the Edinburgh to Glasgow bringing the club into first place from second. They held it to the end and won the event for the only time in their history. There is an excellent and fairly detailed article on the race in “Scotland’s Runner” for January 1990 (p9) which said of Peter’s contribution: “Hawkhead had already fired impressive shots, notably from Peter McColgan who had established a 41 second lead on stage two. McColgan’s time was 68 seconds slower than Ian Stewart’s course record set in 1972. But, despite the possible injustice to Stewart, it might be worth establishing a new record for a stage that has lengthened significantly since then with the construction of two new roundabouts.” Peter’s time was 13 seconds quicker than second fastest Alan Puckrin and he collected the scalps of Chris Hall and Tom Hanlon among many other top class athletes in this very difficult stage. Over the country in the national, having already won the Irish championship he tackled the National Championships at Irvine on a dreadful day just one week later. He won the event (beating Neil Tennant by 24 seconds) and led Hawkhill to third place. 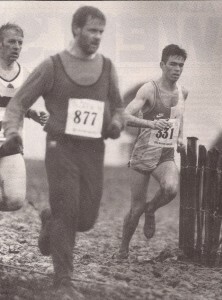 For an idea of the conditions, see the picture above from “Scotland’s Runner” and their report, after lamenting the state of the course, read: “The master of the conditions in the Scottish Cross-Country Union’s centenary season was Northern Ireland’s Peter McColgan – the Arbroath based athlete scoring a memorable double in the wake of winning his native title the previous Saturday. Now why did he change his mind about competing in Scotland? 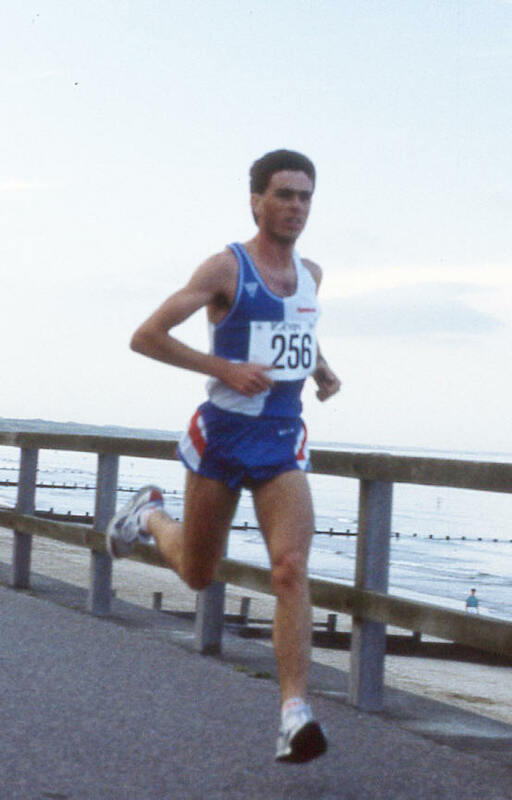 McColgan said afterwards that it was a last minute decision to compete at Irvine, which probably deprived Neil Tennant, second this year, of a repeat of his 1988 triumph on the same course . Bobby Quinn, repeating his rehabilitation from his serious leg injuries, was third.” He did not run in the Six Stage Road Relay but Dundee Hawkhill won the event anyway. Two national titles in the same season was good work and he followed by going into the summer via a second place in the Scottish Indoor 3000m championships where he was defeated by Ireland’s Nick O’Brien (8:10.70) in 8:16.51. Excellent times were achieved at five distances in summer 1990. 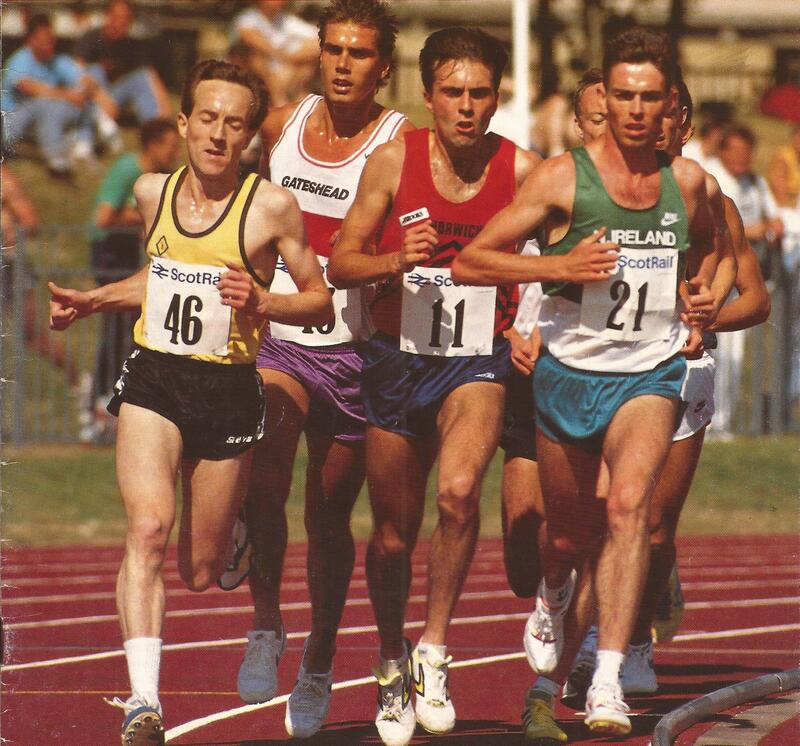 He started with a 14:38.3 5000m win at Crownpoint in a Scottish League match on 20th May, and then skipping the East District Championship, he went on to victory in the Scottish 5000m title from Paul Dugdale and Gary Nagel (both English) in 14:10.09. His best marks however were as follows. At 1500m he ran 3:48.60 when winning at Gateshead on 19th August; at 3000m 7:54.33 when finishing third at Belfast on 16th July in the Pearl meeting and 8:10.65 at Gateshead when finishing thirteenth on 17th August; and, at 5000m 13:48.66. Over the barriers of the steeplechase, he ran 5:34.14 for 2000m and 8:34.10 for 3000m with an 8:37.68 at Crystal Palace in the Parcelforce meeting. What were these anchor legs? Dundee Hawkhill won the McAndrew Relay at Scotstoun on the first Saturday in October. McColgan ran the final stage and had sixth fastest time of the day – and second fastest time for the Hawks with his time of 15:16 being beaten by Steve Ovett (14:49), Chris Robison, Steve Binns, K Logan and Chris Hall (Hawkhill – 15:15) He was fastest in the East District relay with Hawks again winning. He didn’t run in the E-G, but there were only more championships that year for him – the National where he was second to Tom Hanlon (Hawkhill also second) and in the Six Stage he ran the last leg moving from fourth to second, passing Nat Muir en route, with third quickest of the afternoon for more silver for the team. In season 1992/3 he ran the second stage of the E-G moving from fourth to third in the team that was fifth. In the Six Stage Relay he ran on the short fifth lap and set a new stage record when he went from second to first in the team which won the event. There were some other good runs – 8:56.9 for the steeplechase in 1992, 14:52.36 for 5000m and a steeplechase in 9:15.41 in 1993, an E-G second stage in the eighth fastest time keeping his team in fourth place in 1993, a new short stage record in the Six Stage Road Relay in 1994 and a 4:05.6 mile in Derry in August 1995 plus 1:55.6 for 800, 3:50.3 for 1500m in the same year – but by now, in his thirties, his top class racing career was at an end. But by now he had done all his personal best times and was racing sparingly in Scotland. 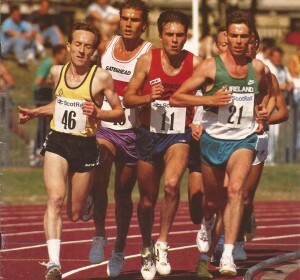 A sub-four miler, he had run well, won national titles on track and over the country, represented Ireland and Great Britain, helped the Hawks to gold, silver and bronze in District and National championships on the road and over the country and generally added to the quality of athletics in Scotland in the period from 1987 to 1992. We should maybe finish with a note of Peter McColgan’s personal best times.